There’s Fish in Them Waters!!! Greetings friends from the shores of supernatural British Columbia. 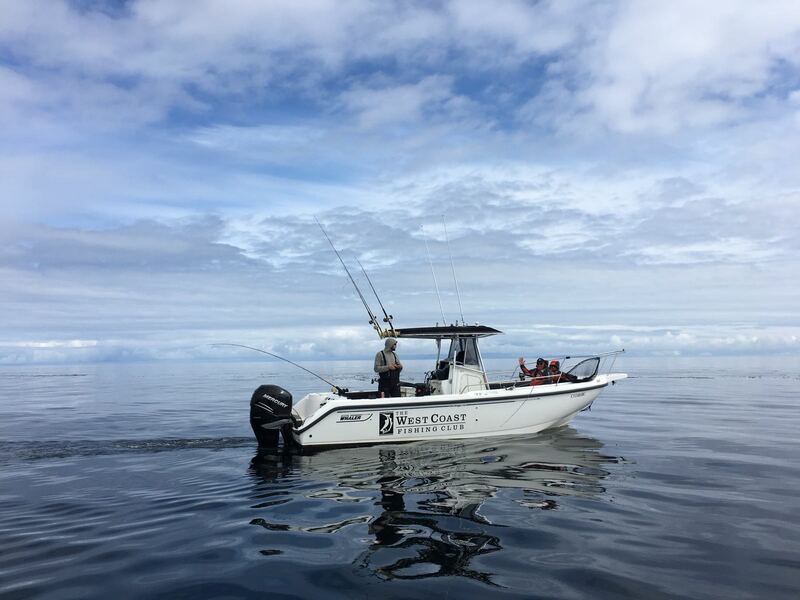 I can’t tell you how relieved I am (we all are) to tell you that the fishing is at last looking a whole lot more like what we are used to seeing in the month of June, both at Langara Island and down Port Louis way. Let’s begin with a report from North Island Lodge, which this week played host to the ninth annual Reeling For Ronnie Fishing Tournament, in which 24 of the best friends a guy could ever have (this would be friends of the late Ron Brown) gathered to raise some money for the Ron Brown Scholarship Fund and have some big fun. 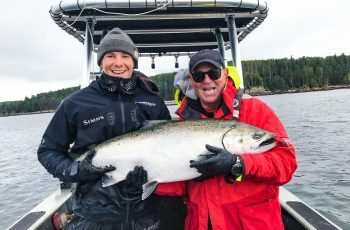 Arguably the most fun was had by Keith Dagg, who according to lodge manager Todd McIntyre is a highly seasoned angler from Victoria. 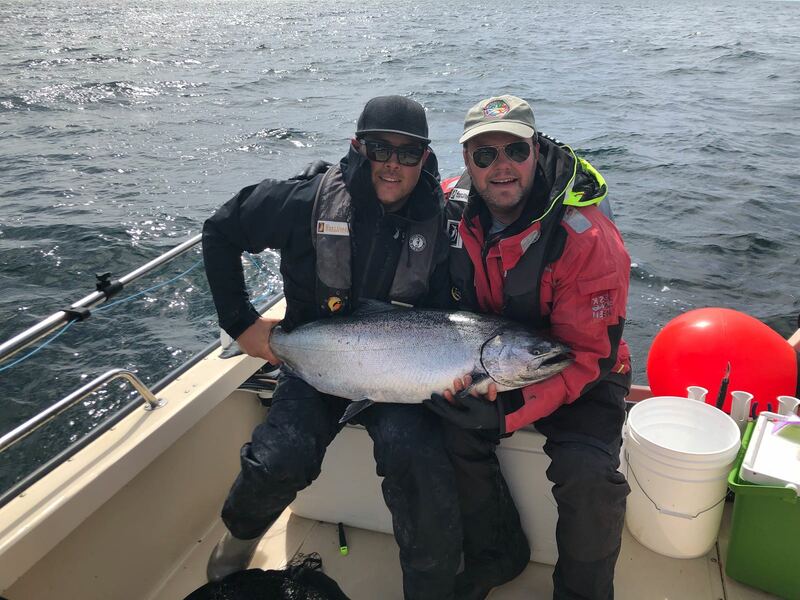 Keith undertook a self-guided mission to Andrews Point where he landed a 38-pound tyee – the largest of the year for North Island Lodge – and took first place in the tournament. The 9th annual Reeling for Ronnie Tournament members. Jamie Fay and Steve Cabonell took second and third places respectively, with 28 and 26-pounders, both off McPherson Point. Our hats also go off to chief organizer Richard Lock and the Lock Search Group for making this tournament what it is every year, and to my old friend Dave Matuschewski, who once again donated prizes of wine baskets, rare scotch whiskeys and coveted tickets for a concert and evening at Mission Hill Winery. Overall, this is a truly inspirational group of anglers who have given us all a poignant example of how good-hearted people can do good things, including paying tribute to someone they lost, and have the time of their lives doing it. This year’s tournament raised $8000 to help a deserving student receive post-secondary education, but there’s more to this great story, which you can read about here. 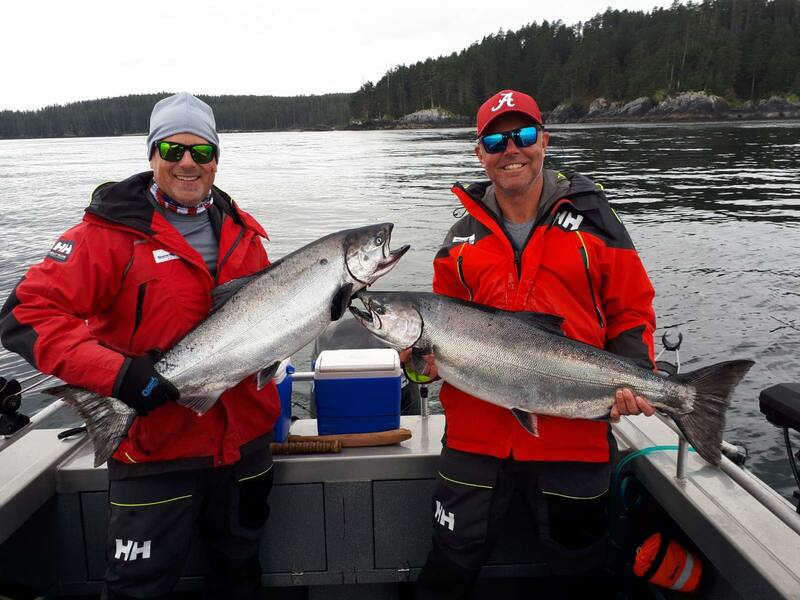 Steve Carbonell and Jamie Fay with 26 & 28 lb June chinook. 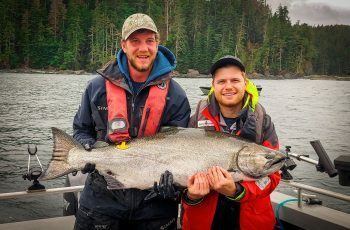 Dave Matuschewski with a 32 lb chinook caught at McPherson Point. 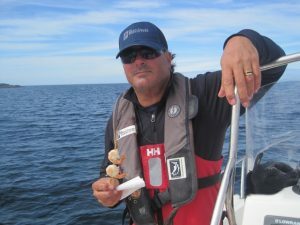 Not only has the fishing picked up but the weather has been much more cooperative after some very breezy days. 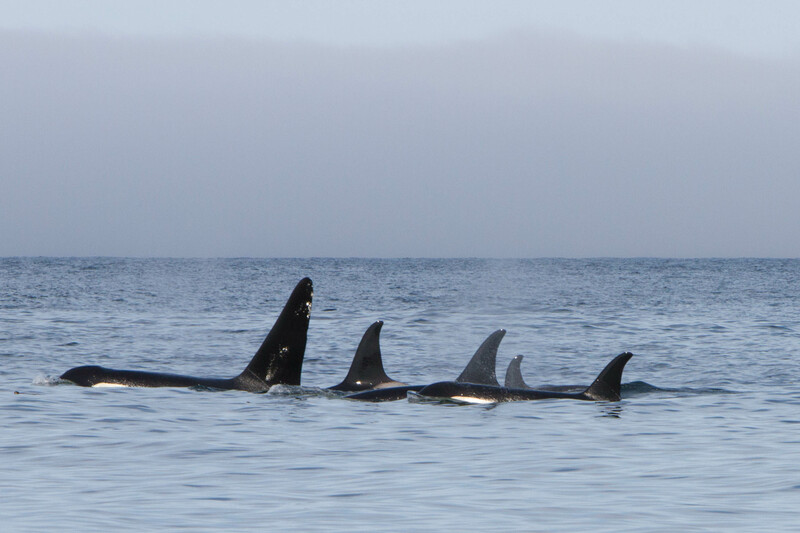 The wildlife experiences are extraordinary too, with whale sightings being the daily norm. Lots of fish in the low to mid-twenties have been hitting the board this week, with good action along the east side, the Highway between McPherson Point and Langara Rocks, and offshore of Pillar Rock. The hog havens between Boulder Rock and Gunia Point have been a bit slower, as has Lacey Rock, although Lacey has occasionally been a good spot for turkey-sized halibut. 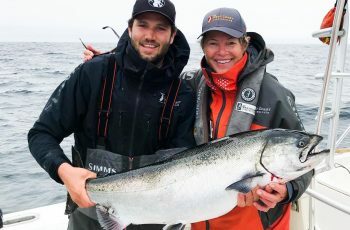 With the reduced size limit imposed this year (115 centimetres) a lot of guides and self-guided anglers have abandoned the ugly sticks in favour of simply finding some flat bottom on the sounder and dropping the cannonballs down to just a few feet above. The vast majority of the halibut have been caught using this method this year, and often in relatively shallow water. 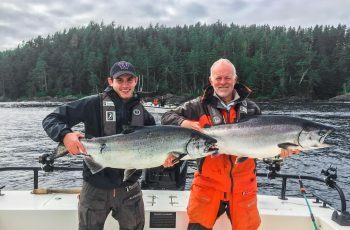 I have dragged up a few 25-50 pound fish over the years this way, and my personal favourite place for doing it is just a few hundred metres off Lacey Rock, but the guides seem to be finding them in a whole lot of places. 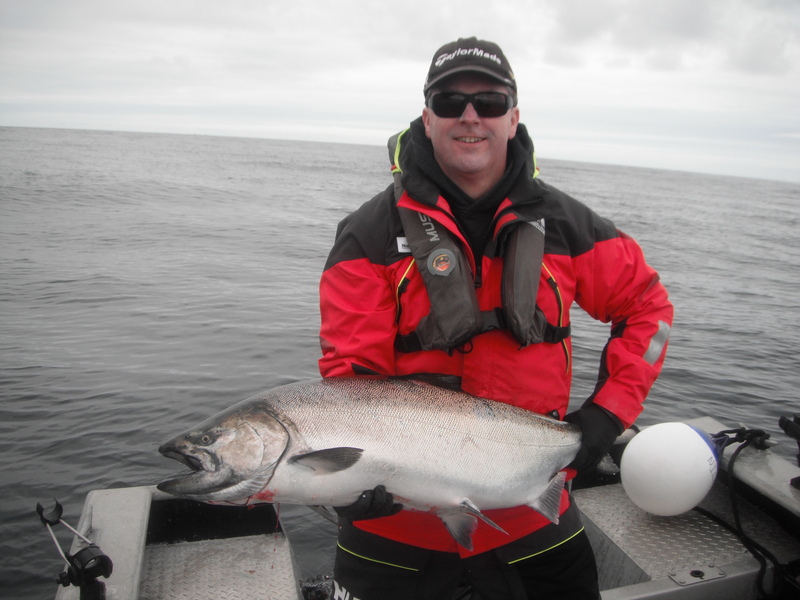 The coho are also showing up in greater numbers, and even some in the 10-pound plus class. Glassy seas and blue skies for Langara Island. A pod of orca whales around Langara Island. Screamer’s latest report provides some insight on the fishing for the gang at The Clubhouse. You can read it here. 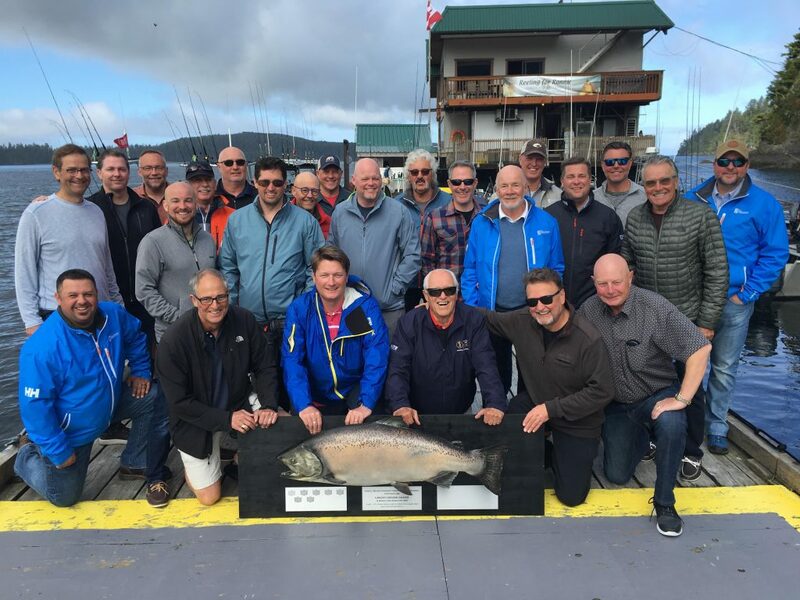 The top fish for the trip that wrapped up June 21 was a 28 for Ken Konkin, which makes him the winner of the inaugural Fathers’ Day Tournament, which promises to be a grand annual affair at The Clubhouse. (Watch for a full wrap-up of this newest addition to The Club’s special events calendar in the days ahead.) Brad Weston picked up a just-shy-of-23 pound model while Jim Caccaco and Emma Vansickle each bagged a 21. In the “It happens but not very often” category, Ray Murakami hooked and landed an eight-pound…wait for it….steelhead! Ken Torpy, Joe Van Sickle, Brad Weston, Kim Priebe and Ken Konkin with Father’s Day Trip host, Les Stroud – Survivorman. Jim & Christopher Caccaco enjoying the Father’s Day Trip & their 21 lb chinook. Top anglers for the June 21-24 excursion to The Clubhouse were Jon Kaplan with a 31, followed by Norman Karran and Peter Gallagher who boated identical 23-pound versions. 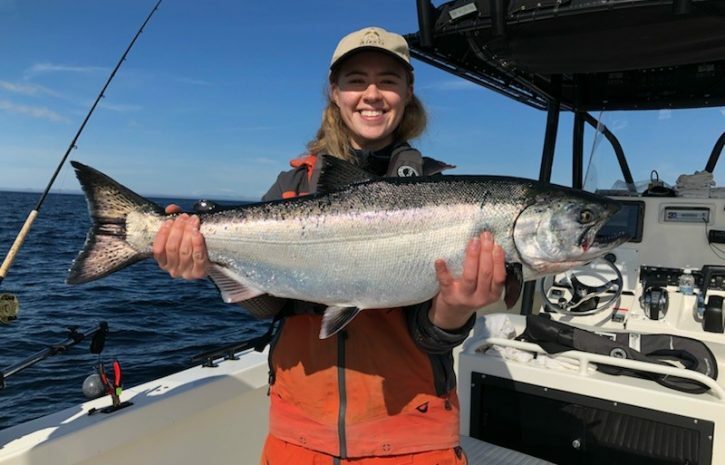 With more action of late, guests have been doing a lot of catch-and-release fishing in order to adhere to the one chinook salmon per day retained catch limit, and the two chinook possession limit. Those local regulations are tentatively slated to revert to two and four, respectively, on July 10. 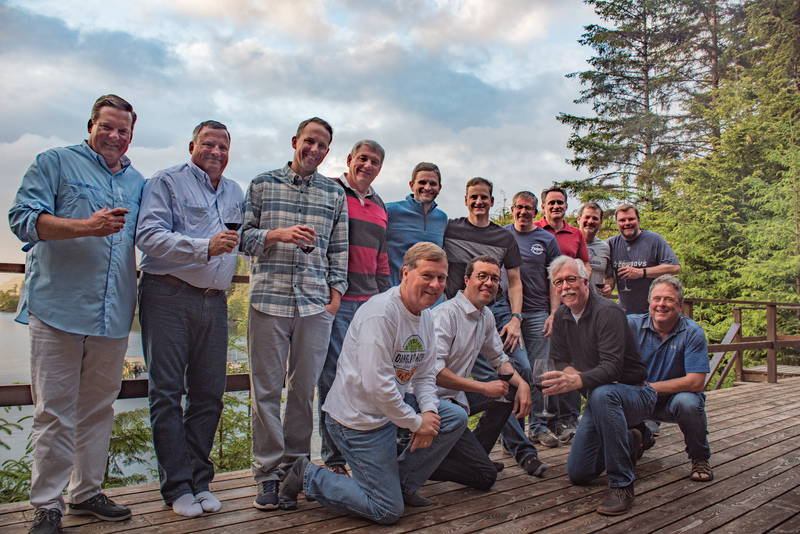 Thanks to the Boeing group for joining us this season at The Outpost. The highlight of late for The Outpost congregation just happens to be the top fish of the year in those parts, a 41 caught and released off Tian by John Kirby. Nice work on the rod John and kudos for the release too. 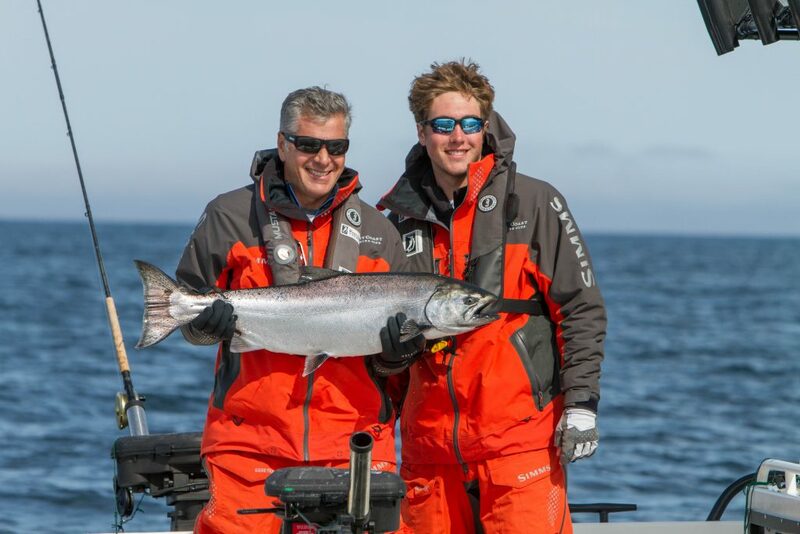 Outpost lodge manager Jordan Knight with John Kirby and a beautiful released 41 lb tyee. 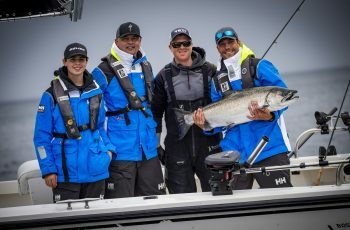 One last thing – wherever you are across this great land, on behalf of everyone at The West Coast Fishing Club, I want to wish you a Happy Canada Day weekend, along with our hopes that everybody can find some time in the days ahead to be in the great outdoors, and to make some memories with those who matter most. To our legions of American friends who will be visiting Haida Gwaii or any other region north of the world’s longest unprotected border this coming Canada Day weekend, thank you for being a part of our celebration, as we look forward to being a part of yours, come this Fourth of July. Until next week, stay safe and well friends. And always, always keep a tight line! Hi Don, on behalf of the Reeling for Ronnie group I would like to thank the WCFC for their incredible support or our trip every year. Honorable mention to Todd McIntyre who again generously donated his guiding skills for an afternoon, which raised $1000 for the charity..quite a guy. 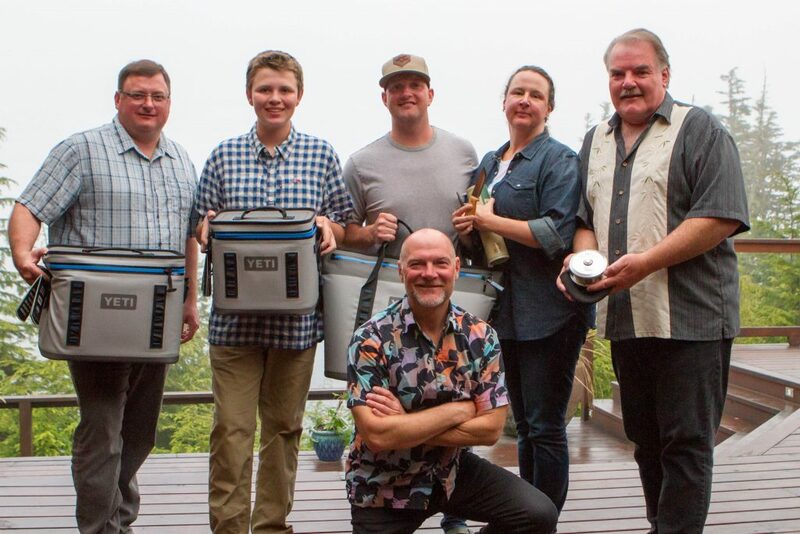 On behalf of Todd and The West Coast Fishing Club, thank you for doing what you do. We always look forward to hosting your group each year. Where is Tian ?? 41 pounder caught in this area !!! Outpost guest, John Kirby caught and released this one at Tian Islets, just North of The Outpost.